CIMC is a state-owned listed company found in 1980, and is among Forbes’s “Top 2000 World Leading Companies” in 2009. It has over 150 subsidiaries and 63,000 staff across China, North America, Europe, Asia and Australia. In early 2005, Yi started showing signs of gum bleeding and bruising. Doctors told him that he had leukemia. He was only 25. 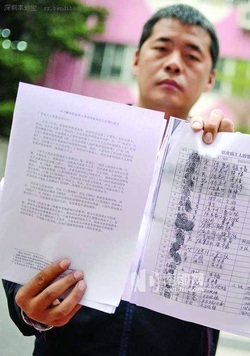 By chance Yi came across evidence of bribing by the factory to the local occupational disease diagnosis institutions. Suspicious, Yi appealed to the provincial diagnosis board and finally received a confirmed diagnosis in 2007. Only then could he be entitled to treatment under the national work injury system. Since Yi’s success was made known, more workers from CIMC have stepped forward to demand recognition and compensation for their occupational diseases. Four more has been diagnosed. At the moment all five of them are still suing CIMC for civil compensation.